Marco works with an American peer. When Marcos Henrique arrived to the U.S. for the Brazil Basketball All Star Sports Visitor Program, he hit the ground running. Along with 13 teenage peers, Marcos was selected by Consulate São Paulo to participate in this fast-paced 10-day exchange focused on how basketball and bilingualism can empower youth. This group makes up the São Paulo Shooting Stars, a program that provides English language instruction, basketball training, and leadership workshops to public school students in São Paulo’s urban areas. This background put the student athletes on a fast-track to engaging firsthand in dialogue with their American counterparts during visits to local area high-schools and sports clubs. After their time in Washington, D.C., the São Paulo Shooting Stars were geared up to attend the NBA All Star Basketball games in Houston, Texas. Marcos recognized the value of communicating with everyone he met in both cities. 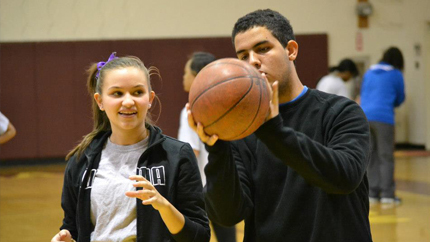 Throughout the program, he enthusiastically shared his perspective and learned from others at basketball clinics and sessions on everything from nutrition and peace-building to disability sports and community service. Marcos looks forward to garnering the momentum of the exchange to develop more Brazilian programs that link basketball, leadership, academics, and teamwork.